Do or Die – The Complete Set! 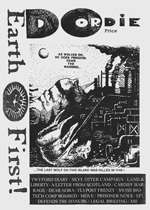 A few years ago a friend asked me if I had a complete set of Do or Die, the British Earth First! 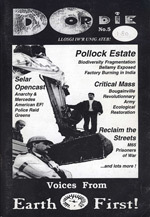 publication that inspired and incited eco-warriors throughout the 1990s and early 2000s. At one time I did have them, but they had long since been stolen by a Joint Terrorism Task Force. After a brief discussion, we decided that Do or Die was too important to fade into obscurity. We began tracking down each issue, and decided that while we were at it we ought to archive some other publications as well. 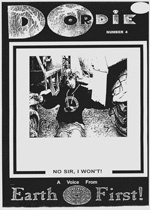 That effort is how this web site began, and now, thanks to 56a infoshop of South London and Tim @ NEDS Northampton, we can finally share the very rare issue #2. This completes our collection, and our original mission as well. 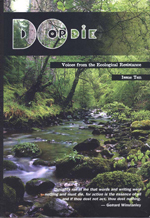 When read as a set, Do or Die is a chronicle of people from across the globe counter-striking capitalism, ecocide, and the state. Each issue is better than the last, but more importantly, each page is a spark licking at the fuse of the bomb that is your heart. Once lit, you’ll know that these pages are not mere history, but a reminder that we can explode onto the world stage like the fighters before us have. Do or die, now is the time to rise. 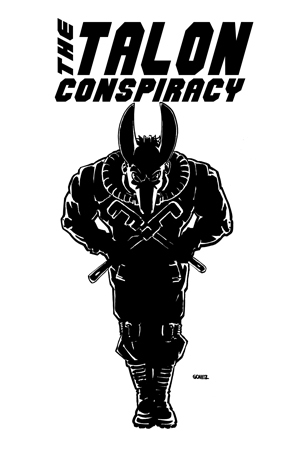 By the time 1997 rolled around Britons could not help but be aware that something major was afoot in their country. Dock workers were uniting with anti-car anarchists, squatters were preventing the demolition of entire communities by occupying building slated to be torn down, there seemed to be a punk or a hippie in every tree in the whole damned country, and when police got in the way they faced riots as a result. Amidst this flurry of activity though, those on the inside knew that their movement was in terrible danger from forces both internal and external. With time short and resources low they began to discuss how to prevent catastrophe. In the end they failed, but they left behind a wonderful warning of what happens when we analyze our tactics, morale, and outreach too late. 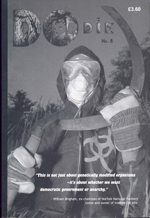 This is not to say that Do Or Die #6 is a doom and gloom journal of a dying movement. Much to the contrary, this issue foresaw the collapse but was written when activity was still peaking. 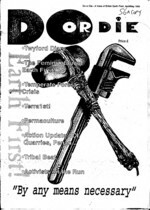 Amongst the analysis of their campaigns and politics, Earth First in the UK and Europe as a whole found plenty of time to get down to the joyous work of resisting industry and capital. There is no way that one can not read some of the stories inside without feeling a boost of adrenaline. From the theft of bulldozers to destroy a construction site to the rampaging of drunken elephants against military bases, to the building of a free state on american soil, all variety of species get down to the usual business of ruining business as usual. Inspiration abounds! From the 1980s until present environmentalist have done a number of high profile campaigns to protect wilderness areas in the Northwest of the United States. I have a special affinity for these actions. 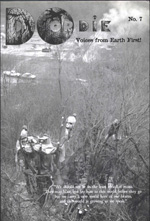 Having grown up in Eugene, OR in the 80s, I remember seeing college kids from the University with their Earth First! patches, going to coffee shops where groups of crusties, hippies, and career activists hunkered down in dark corners planning blockades, and going to mailing parties at the Journal house. The wild areas of what is known around those parts as Cascadia are amongst the most beautiful and important on earth, and I consider them home. 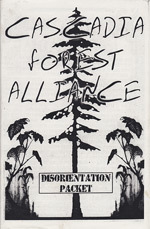 Militancy in defense of the planet is an artform, and this publication from the Cascadia Forest Alliance aimed to bring the basics to the masses who showed up at camps in the woods, eager to get active. 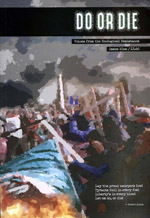 It explains the basics of anti-oppression policies, direct action, and security culture. Sadly, it also contains a section on consensus decision making. 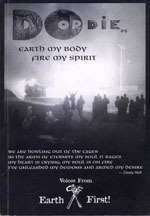 The staff of Conflict Gypsy would like to go on record as being opposed to consensus decision making in groups. The idea of consensus allows a single obstructionist to essentially become a dictator who blocks the will of the rest of the organization. The person who least agrees with the goals and tactics of the group can slow progress, and the earth doesn’t have the time to accommodate their concerns. We have seen consensus groups regularly push out the most talented activists and organizers because a tyranny of the minority is created by a system meant to empower everyone. 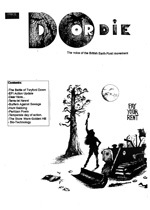 Despite what we see as a flaw in their logic, CFA did wonderful work, and this packet sets the standard for what forest activism primers should be.